Oddly, this is not a scam. 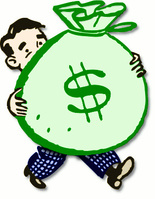 It is estimated that one in ten people in Massachusetts have unclaimed property. I am currently working with State Treasurer Deb Goldberg’s Office in a partnership program to help reunite members of my district with their unclaimed property. Since you may be one of these individuals with property held by Treasurer’s Unclaimed Property Division, this is your opportunity to get it back! Each year, the Commonwealth of Massachusetts receives large amounts of unclaimed property, including forgotten savings and checking accounts, uncashed checks, insurance policy proceeds, stocks, dividends, and contents of safe deposit boxes. Most of these accounts are turned over to the Treasury after three years of inactivity. The Division has a website, findmassmoney.com, where you can search for property and make claims. This past year, the Division was able to reunite over $112 million with over 45,000 residents, businesses and charities in the Commonwealth. This coming year, the Treasury is hoping to return even more money to more citizens. The Treasury is holding unclaimed property, which may belong to you. If it’s your money or your property - you should reclaim it today! The faster you file a claim, the sooner you will be reunited with your money, so please respond right away. Please do not hesitate to contact me if you have any additional questions.